In the first chapter, we study basic notions about surfaces, such as their two fundamental forms, the Gaussian curvature and covariant derivatives. We also state the fundamental theorem of surface theory, which asserts that the Gauß and Codazzi-Mainardi equations constitute sufficient conditions for two matrix fields defined in a simply-connected open subset of ℝ2 to be the two fundamental forms of a surface in a three-dimensional Euclidean space. We also state the corresponding rigidity theorem. The second chapter, which heavily relies on Chapter 1, begins by a detailed description of the nonlinear and linear equations proposed by W.T. Koiter for modeling thin elastic shells. These equations are “two-dimensional”, in the sense that they are expressed in terms of two curvilinear coordinates used for defining the middle surface of the shell. The existence, uniqueness, and regularity of solutions to the linear Koiter equations is then established, thanks this time to a fundamental “Korn inequality on a surface” and to an “infinitesimal rigid displacement lemma on a surface”. 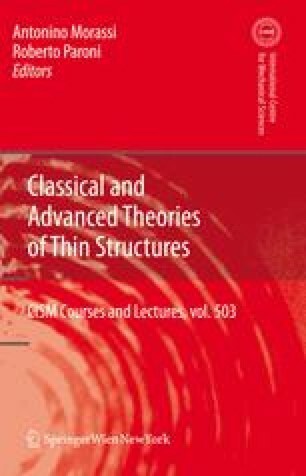 For the most part, this article is adapted from Chapters 2 and 4 of my book “An Introduction to Differential Geometry with Applications to Elasticity”, Springer, Dordrecht, 2005, the writing of which was substantially supported by two grants from the Research Grants Council of Hong Kong Special Administrative Region, China [Project No. 9040869, City U 100803 and Project No. 9040966, CityU 100604].